A politically connected engineering company that received massive stimulus contracts has admitted that workers committed widespread fraud under the encouragement of its executives while working on a major taxpayer-funded nuclear cleanup effort. 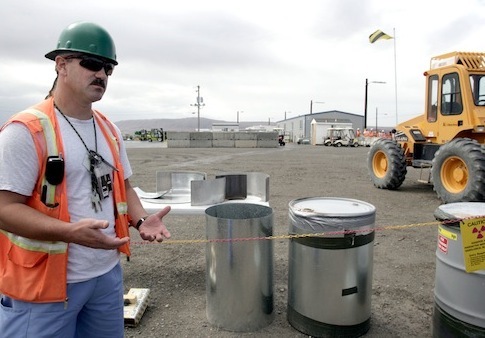 Employees of CH2M Hill routinely inflated hours worked on the cleanup effort at the Hanford nuclear waste site in Washington state between 1999 and 2008. Company executives sanctioned those violations in order to obtain bonuses that required certain performance benchmarks, according to an agreement between the company and the Justice Department filed in federal court on Friday. Subsidiary CH2M Hanford Group Inc. (CHG) agreed to pay $18.5 million to resolve civil and criminal allegations brought by the federal government. The civil charges were initially filed by a company whistleblower. According to a DOJ press release, CHG "routinely overstated the number of hours they worked, and CHG management condoned the practice and submitted inflated claims to the Department of Energy that included the fraudulently claimed hours." Members of CHG’s "upper management" facilitated and encouraged that fraud in order to preserve corporate bonuses that required the company meet certain performance measures, according to the court agreement. The timecard fraud took place between 1999 and 2008 when CH2M was servicing a Department of Energy contract worth $2.2 billion. A different CH2M subsidiary was awarded an additional $1.3 billion in 2009 for the Hanford cleanup. Those funds were a product of lobbying efforts by Sen. Patty Murray (D., Wash.), who worked to increase stimulus funding for nuclear cleanup projects. Murray was present at meetings between CH2M executives and Energy Department officials in 2008, during which the company helped the department shape the stimulus package. An undated presentation by three CH2M staffers singled out Murray as a "crucial congressional ally." She managed to win $6.4 billion in stimulus funding for nuclear remediation projects—nearly 13 times the funding included in previous drafts of the legislation. The following election cycle, CH2M’s political action committee quadrupled its contributions to Murray’s campaign, donating more to the Washington Democrat than it had given to a Senate candidate before or since. CH2M also enjoyed political clout through Robert Card, former president of the company’s energy, water, and facilities division. Card was the DOE official in charge of the Hanford project from 2001 through 2004. He faced conflict of interest questions during his time at the department. Stimulus spending was designed to spur job creation, but CH2M subsidiaries working on the Hanford cleanup have been plagued by layoffs since they were awarded stimulus contracts. The Energy Department’s inspector general recently faulted CH2M for providing inaccurate cost data to support its expenditures on the Hanford project. Senator Murray's office did not immediately respond to a request for comment. This entry was posted in Politics and tagged Democratic Donors, Department of Energy, Stimulus. Bookmark the permalink.